This is a small add-on that makes a rather minor change to the UI to show both the player and bank free space and maximum size. I have found it annoying that you do not know your backpack (plus horse) space available while playing. This makes it more likely to run out of inventory space while collecting materials or running a dungeon or delve. I don't have a great need for some manager add-on, all I really need is something to let me know where I stand so I can make sure to get the important stuff into the bank. This is that add-on, written specifically for my own purposes during Early Access and used by me since then. It adds a floating window that shows the amount of gold, the maximum bag space and amount used, and the maximum bank space and the amount used. These are updated as the information changes. The window can be moved anywhere on the screen, as desired, and the game will remember placement. This window will disappear when the compass at the top of the screen is not visible. As the amount of space used approaches the maximum, the color will change from white to yellow. I have noticed that the game likes to have about 4 open spaces when doing crafting work, so the yellow will appear in that range. When the bank or backpack is full, the numbers will change to red. This is identical to the version offered on Nexus. This Add-on is not created by, affiliated with or sponsored by ZeniMax Media Inc. or its affiliates. The Elder Scrolls® and related logos are registered trademarks or trademarks of ZeniMax Media Inc. in the United States and/or other countries. All rights reserved. 2.0 - Compatible with Update 7 (Imperial City) and API 100012. Introduced new floating window, removed dialog text updates. I am uploading the Shadows of the Hist version today. I don't have any plans to add customization settings to this addon. With the new crafting bag, the bank space is much less of an issue. I am toying with the idea of removing that line for ESO Plus members rather than having a configuration. 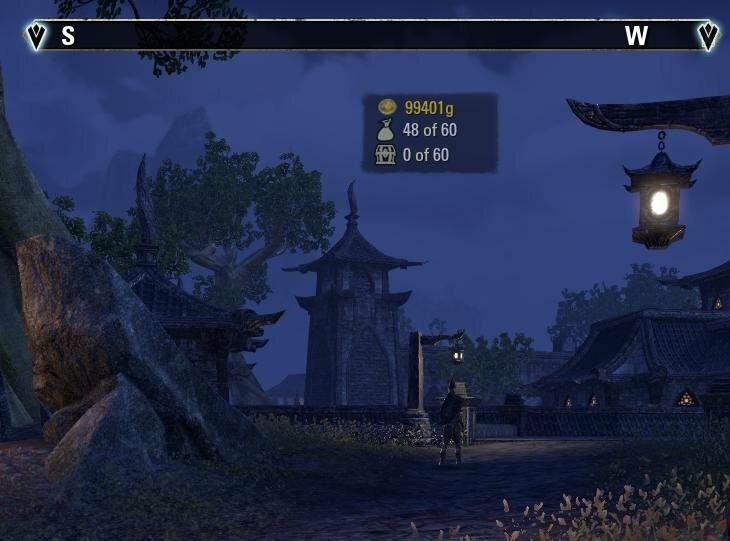 As for the alpha, I would typically tie that to an existing game setting, but ZOS does not have a decent one to use other than the chat box minimum transparency setting, and that would be confusing. How do I move the window to where I want? It seems I've tried everything. The addon is just what I was looking for, just need to move it. The box is moved by switching to "cursor mode", usually by pressing the period key (". "), and then just dragging the box to where you want it.